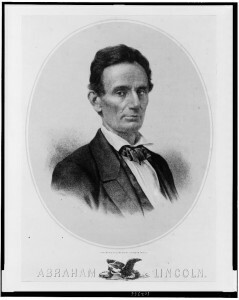 Abraham Lincoln in 1850, the year after he represented George D. Berry in a lawsuit. Lithograph by Edw. Mendel, Library of Congress Prints and Photographs Division, LC-USZ62-102366. My husband inherited several dozen Civil War–era letters from his great-great-grandmother Susan (Berry) Dill and her daughter, Ida Alice Dill, who lived in Sangamon and Christian Counties, Illinois. Ida married Frank Stratton, the brick wall in my husband’s ancestry. One day, in frustration at not finding anything about Frank, I took to Google and entered a string of names and dates from the letters: George Elizabeth Susan Benjamin Berry Christian County Illinois 1850 1860—something like that. If no clue to Frank turned up, I figured, I would learn more about the Berrys. And indeed I did. One hit was from a historic autograph site, selling a document from November 1849: a bill of complaint re George D. Berry v. John S. Cagle. George had sued Cagle for trespass, as Cagle had caused his daughter Elizabeth “to bear an illegitimate child and be sick for nine months.” Elizabeth’s siblings were asked to be witnesses—which is why my whole string of names yielded this hit. I read farther. The document was signed by Abraham Lincoln. The Berrys had hired him as a lawyer. We already had a family story about Lincoln. Frank Stratton allegedly installed the heating system at Lincoln’s Tomb at Springfield, saying, “It took a Johnny Reb to heat old Abe’s bones.” (Born in South Carolina, Frank claimed to have fought for the Confederacy.) But there was no lore passed down about the family’s hiring of Lincoln as a lawyer. Illegitimate birth was apparently a taboo topic. And although we know of no further contact between my husband’s ancestors and the future president, it’s easy to imagine their interest in their lawyer over the next decade. 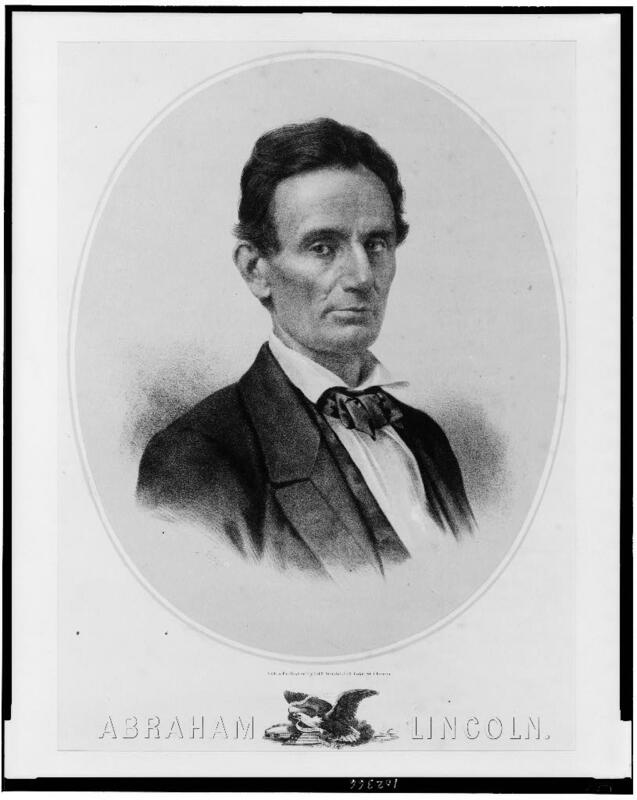 On October 16, 1854, a month before Susan Berry married Ezra Dill, Lincoln gave an antislavery speech at Peoria, reviving his political career. In 1857, five months after Susan gave birth to Ida and about a week before Ezra died at age 23, Lincoln gave a speech in Springfield opposing the Dred Scott decision; the next year he gave his famous “House Divided” speech. In 1860, the year he was elected president, the widow Susan and her two children were living with her parents in Christian County. In some of her letters preserved from 1862, we see Susan was being courted by Civil War soldiers. But given the nature of the 1849 lawsuit, it’s not surprising that no letters refer to the events that linked her family to the sixteenth president. Frank Stratton: still a brick wall. But thank goodness I decided to put that long string of names and dates into Google! The document is described in Abraham Lincoln Sesquicentennial 1959, an exhibit catalog published by the Lincoln Sesquicentennial Association of California in conjunction with an exhibit at the Los Angeles County Art Museum, viewable online at https://archive.org/details/abrahamlincolnse00illinc. George Berry’s visit to Lincoln, on September 13, 1849, is recorded at the Lincoln Log website, www.thelincolnlog.org, and at “Lincoln/Net,” website of the Abraham Lincoln Historical Digitization Project at Northern Illinois University, http://lincoln.lib.niu.edu. “Congressman Lincoln 1847–1849,” Lincoln Home National Historic Site, nps.gov/liho/historyculture/congressman.htm. It is interesting how stories and myths get passed down. My father once told me he was a direct descendant of Abraham Lincoln. What! That is the most ridiculous statement, according to my research and his tree. Now, I feel he did not personally fabricate this, but this myth was passed down in his family, but how do these false stories get started in a family?? BTW, he and his father have the middle name, Lincoln. Now, go figure. If anyone had ancestors in this area during this time period, you might find useful information on anything that would need a good lawyer to settle. Correction – Lincoln’s partner was Thomas L. Harris, sorry. Thank you!!! I went to the Lincolnlog.org and put Hussey in the search box and their were three hits! My husbands family lived in Springfield so I will be putting in their names and see what I can find!!! Interesting article. One branch of my family was in “the right place at the right time,” and my father claimed that his g grandfather, a preacher, knew Lincoln. This g grandfather was married in Sangamon county in 1833. He later lived all over central IL, at the behest of the Methodist church. His second marriage took place in IA in 1851, and he was back in adjacent counties in the 1850s to 1880s. My dad did his research pre-computer days, so didn’t find the resource you cite, Carole. I’ll take a look at it, just in case his certainty did stem from an actual case. You never can tell until you look. Browsing through court records for Moultrie Co. IL, nearby, where this g grandfather lived for a while, and where his daughter married a Waggoner (MY brick wall line), I discovered a case where the judge was a Waggoner and so was the defendant! I wondered why the judge didn’t recuse himself, because every Waggoner in the county at the time was related. We know that much about the family, we just don’t know where they came from prior to the 1730s. My great-great grandfather, Orlando Bell Ficklin, was the opposing counsel during the Matson Slave Trial, in which Lincoln represented Matson ( the slave owner.). Ficklin actually prevailed over Lincoln, resulting in the decision that gave the Matson slaves their freedom. I just read this post and found references to a family that is somewhat of a brick wall for me – the Dill family. My Dills are related through the Pryors, all apparently originating from South Carolina, moving to Jackson County, Tennessee, and then to Missouri. Does this background relate to your Dills at all? In addition, the comments include a reference to the Waggoner family, to which I am related by marriage in Kentucky (Fryman and Snapp families in early 1800s) and before that in Pennsylvania (mid to late 1700s). I wonder if any of us are related. Amazing coincidences, whether we are related or not. Lincoln’s parents were married in the home of Richard Berry. I’m sure it must be a relative.